When does a white lie turn into a big lie? When does a simple tease at the lunch table turn into an eating disorder? When does the need to be popular turn into peer pressured drug and alcohol abuse? You want to answer with a "never" but we know it's really more of an "often." The foundation for character education can begin as early as preschool. We all read the news. Bullying and violence are sadly becoming an every day occurrence, when all we really want is for our children to feel safe. We want to nourish and encourage self esteem, self worth, respect for oneself and respect for others, kindness, and knowledge. 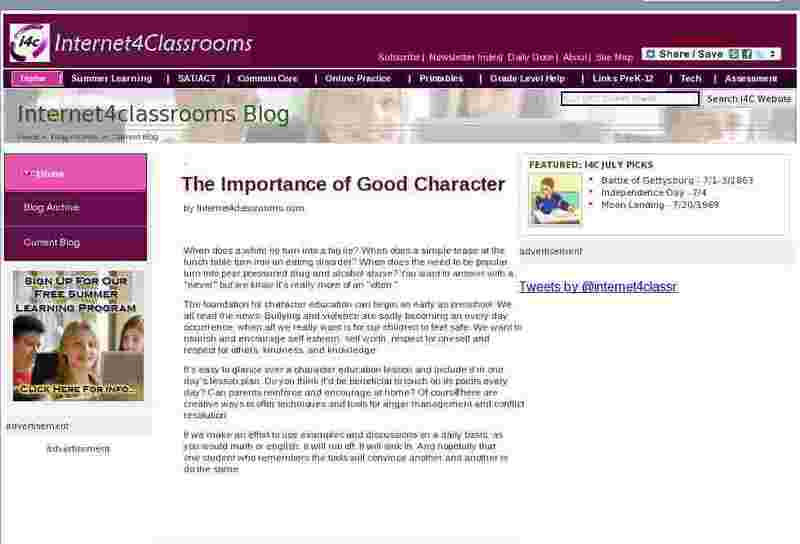 It's easy to glance over a character education lesson and include it in one day's lesson plan. Do you think it'd be beneficial to touch on its points every day? Can parents reinforce and encourage at home? Of course. There are creative ways to offer techniques and tools for anger management and conflict resolution. If we make an effort to use examples and discussions on a daily basis, as you would math or english, it will rub off. It will sink in. And hopefully that one student who remembers the tools will convince another and another to do the same.